Taking out a car loan is an important decision that you should carefully consider. Among the many factors to consider is your personal creditworthiness, how much of a loan you need, and how long you want your loan to be. There are a variety of different options for financing an auto loan, and it pays to compare many options. Below is a review of Wells Fargo Auto Loan products and services to help you make that important decision. While the company has been in the news recently for consumer scandals, they are working hard to regain consumer trust and have revamped their auto loan system. Your fee for starting the loan is included in your monthly payments rather than charged upfront. Auto loans are only available for up to 72 months, so if you need a longer loan, you’ll need to look elsewhere. History of very questionable financial practices, especially towards those who pay off their loans early...and charging customers without their knowledge. Yikes! If you live in Louisiana, you’re out of luck: Wells Fargo doesn’t service loans there. The vehicle’s VIN, year, make, model and mileage. If you are refinancing your loan, you will also need proof of car insurance. The annual percentage rates listed below are the absolute lowest you would pay—and assume that you have excellent credit as well as a reasonable loan amount that is for no more than 85 percent of the vehicle’s cost and also above $22,000. Notably, the rates also assume that you have a Wells Fargo checking account that you’ll be making regular payments from. If you do not, you can add on an additional 0.25 percent to these rates from the get-go. If you have a perfect credit score, you will likely pay something similar to these rates. The lower your score though, the more you can expect to pay in interest. New Car Loan Financing: This product is available for those who purchase a new car directly from a dealer. Used Car Loan Financing: These type of loans are available both for those who are planning on buying a used car from a dealer and also for those who are buying from a private seller. Starting APR: 4.14 percent for those buying from a dealer; 6.84 percent for those buying from the private seller. 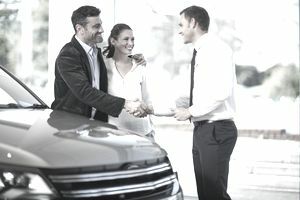 Lease Buyout Financing: If you lease a car and decide that you want to keep it at the end of your lease term, you will probably need a loan in order to do so. If you have a car loan but are dissatisfied with your rate, Wells Fargo might be a good option. Bottom Line: If you have perfect credit and a Wells Fargo checking account, you should definitely consider this product if you are buying a new car that sells for more than $26,000. But if you are buying a less expensive vehicle, a used vehicle, or have less than stellar credit, proceed with caution, and only after you have pre-applied elsewhere. It’s also important to remember that you will have to know what vehicle you want before you apply for a loan because unlike many lenders, Wells Fargo does not allow you to be pre-approved.